In case you’re always submitting or sharing PDF files via email or over the web finding the best solution to edit PDF and send a perfect document can be confusing with so many choices. 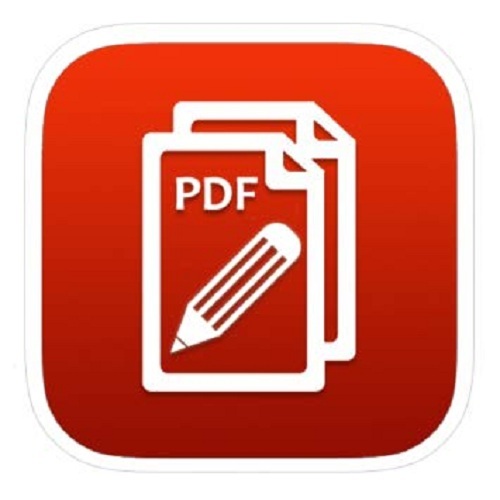 PDF is a digital, portable yet short document format allowing anyone to send files others can read no matter the type of software, hardware or gadget used to view the document. To adapt photos and text to your PDF viewing device modification and editing might be needed, which isn’t that easy in PDF. However, the good news is it can be done. Windows to Mac users can modify graphics and texts in PDF format wherever they’re through a number of tools. Here are the best simple solutions to edit PDF. While your default PDF tools might not be able to make changes in the PDF, you can do so with PDFelement. It is a lightweight, robust Adobe Acrobat Alternative. Whether you want to read, edit, annotate, create, convert, protect or OCR PDFs, PDFelement has it all. The app feels capable, stable and surprisingly easy to use. When we first reviewed PDFelement, we were delighted by how well it achieved a balance between cost, ease of use, and a comprehensive feature set. Now let’s see How to edit a pdf using PDFelement with ease. 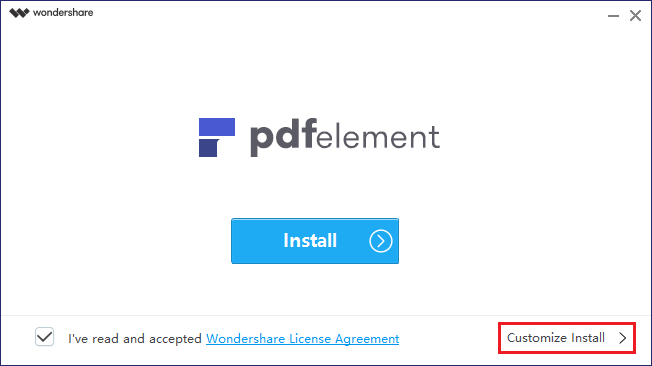 Visit https://pdf.wondershare.com/ and download PDFelement in your computer. Open the target PDF using PDFelement. Start editing text and images on the PDF. Simply click Edit Text from the top menu and through double clicks on text to be changed begin replacing and typing what you want, including changing the color, sizes to font sizes. Delete or add the text by going to Edit Text and select the text you need to remove. Use keyboard “Delete” or “Backspace” to do this. Clicking Add Text allows you to draw boxes using your mouse and adding the text. PDFelement includes great features such as OCR (optical character recognition) allowing you to edit text in scanned or image-based PDFs and convert any type of PDF to various formats such as EPUB, Excel, Word, and Image to PPT. Other features include easy and quick annotation and editing of PDFs, signing contracts and filling forms easily and compatibility with MacOS and Windows. PDFelement is free to download. Premium standard version costs a one-time $59.95， now it provides an exclusive 50% OFF discount for a limited time. If you want to look for the more advanced feature, please take a look at its’ Professional version (from $99.95). Find out more difference about standard version and professional version, click here. Online PDF editor software is a free tool allowing you to sign and edit PDF files on the web without incurring any cost. 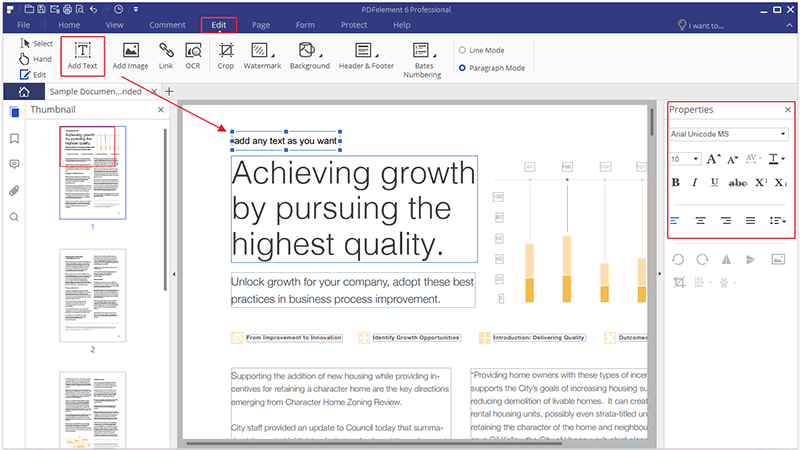 You can fill your PDF document or form and even add shapes, links, text, and images as desired, including annotating and editing existing links and text in PDF. Features are basic and useful if all you want is a simple PDF editing process. Go to Sejda website (or any PDF online editor site). Upload the PDF you need to edit (or drag and drop it) into the website. One of the things you notice with online editing software such as Sejda is that uploads are done over encrypted connections in a private and safe process. After you’re through with editing, files are then deleted. They also come with desktop features allowing you to work on your documents on your PC. With cloud computing virtually inescapable, online PDF editing tools also include cloud compatibility features, such as Google Drive and Dropbox where you can pick your PDF documents from. Ensure your PDF file has been uploaded. On the top menu choose the addition or edit type you need to complete. Ensure you’ve selected the Text tool at the toolbar on the top. Use mouse on the document to choose what to modify and edit as needed. The text that needs editing is what you click. For existing text modification in Sejda, choose Text on the toolbar and hoover cursor on the text you want to modify. Once done ensure all changes are saved and download the PDF as edited. Carry this out by clicking Apply Changes tab to ensure all the changes you’ve effected are applied. You can then go ahead and click Download to deliver the PDF with all the edits as you wanted them in your computer. 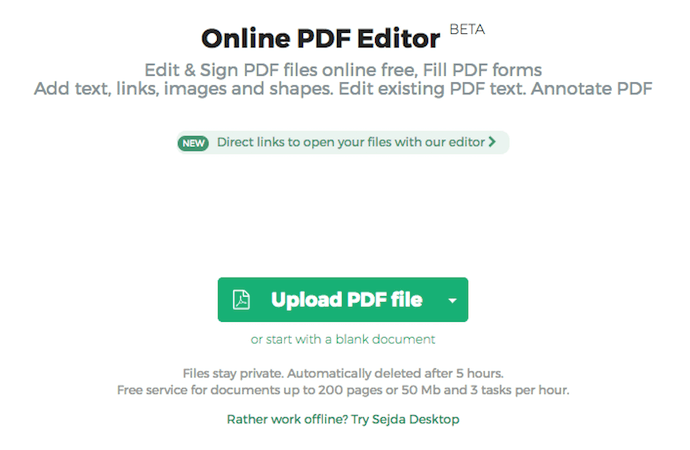 Sejda is free to use and good for short PDF modifications but doesn’t accept any PDF above 50MB. Sejda also deletes your edited PDFs after 5 hours. The features are also minimal with a basic content eraser and no OCR. Acrobat PDF editor tool that works for windows is provided by two versions. One is Acrobat Standard DC for Windows only, guaranteeing reliable creation, signing and editing of PDF files and available from $12.99 per month or $155.88 per year. You’re also required to annually commit to pay for the tool and team licenses are also available. The second version for both Windows and Mac users is Acrobat Pro DC, assuring complete PDF features and much more and begins from $14.99 per month or $179.88 per year. You’re also required to make annual commitments and team licenses are also available. Begin by running Adobe Acrobat on your computer. Ensure that you’ve downloaded Adobe Acrobat on your desktop or laptop before you begin the PDF editing process. Click Open from File and choose the PDF document from the dialogue box. Opening a file inside Acrobat allows you to begin fast and easy. After opening your document choose Edit PDF from the toolbar. The Edit PDF tool for Acrobat is situated towards Tools option. Edit text by placing cursor on the words you want to modify. Simply click either the image or text you need modified to continue. As you do this Acrobat guides you by showing the critical tools needed for this. Use Format features from the toolbar on the right to edit the text. Right on the page you can edit or add text. Notice that paragraphs and lines will be reflowing automatically but it’s also possible to just drag and click resizing the elements. Edit any image by positioning the cursor on it and use Objects features to change the image using options appearing under the text preferences. On the Objects list also are all selections you need to resize, move, replace or add images right within the page. You can go ahead and edit the PDF document even further if you so desire. Simply click the Background tool, Watermark, Footers, and Headers or Link and continue. Adobe Acrobat is a useful PDF editor but for more advanced modifications you must upgrade to more expensive versions, which include Acrobat DC Pro Perpetual available from $15 per month and $180 annually to $450. Preview is a MacOS inbuilt tool allowing you to modify PDF easily and fast. 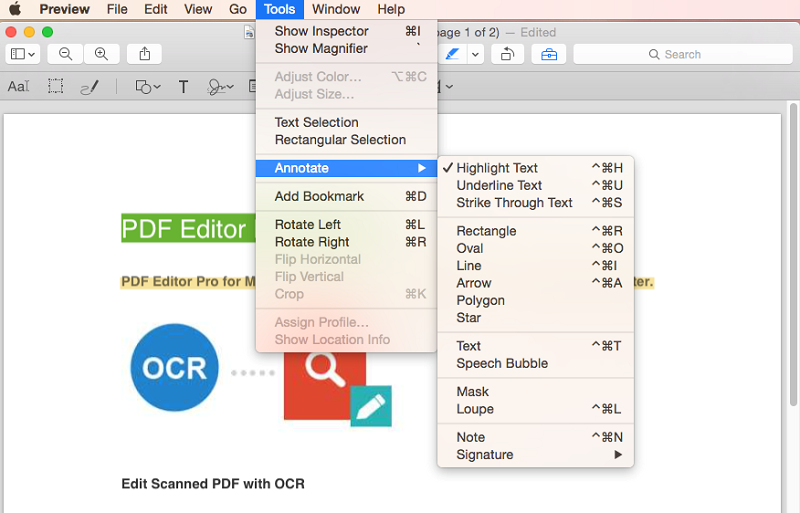 You can use it to strikethrough or underline text, highlight, rotate pages, remove or add pages, add arrows, text and shapes, comments and notes to your PDF documents. A signature can also be added though in an elaborate process and not the most flexible. In Mac, simply open the PDF document to modify and it’ll automatically appear in Preview. Click the edit icon (pencil-like) to have markup tools opened, such as text selection and rectangular selection tools to draw and sketch text and signs, do color fills, select text styles, shape style, notes to borders. The Preview tools can then be used to add needed text, highlight and underline text and even draw into the PDF. To add text you must have a text box. Create one if you’ve not in Preview by selecting Tools, choosing Annotate and Text within the Preview menu. As a result, watch for a small box that should appear in the middle of the page and inside is the word Text (in red). You can then move the text box through a simple drag and drop anywhere across the PDF, including resizing it to agree with the page layout. Add the text you want by simply typing in the text box. Do change the color, size or font of text if you so desire by clicking A icon (slanted), located towards the toolbar’s options on the far right. As a result, more standard formatting choices will come up allowing you to modify and change text including how you’d like it justified, for instance, justified right. In case you need to move any text box on the page, simply click it and drag to wherever you want it. Preview is an inbuilt way of editing PDF in your Mac. However, the process of copying texts, setting up and using text boxes, check-marking in PDF to adding comments, notes and signatures is cumbersome and require lots of elaborate steps. It also doesn’t offer advanced editing options and other PDF editing tools are a better choice, especially if you want to make your PDFs more professional, edit heavy PDFs and modify fast. Unlike Macs, Windows don’t have inbuilt tools for image extraction and PDF editing. You need third-party tools to modify PDFs in any Windows computer. To edit PDF in Windows Office’s Word, you must first download the PDF software such as PDFelement or Acrobat. Once the download is complete open the PDF viewer tool. Go to File and click Open or equivalent in the software of choice and choose the PDF document you want to modify from the dialogue window that opens. 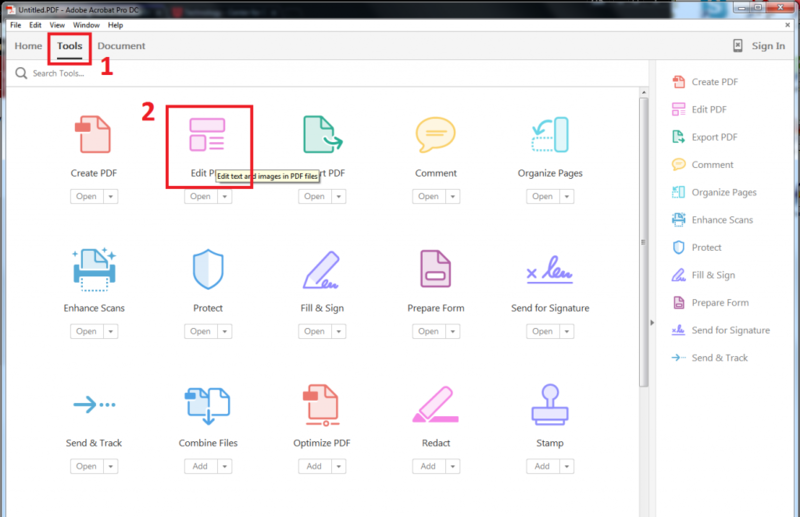 After opening the file go ahead and export the PDF using Export icon on the toolbar. Choose Microsoft Word as the destination of the export and complete the exercise. Do go ahead and open the exported document in Word and edit the text and images as required using Word features and options. Save the document once done. On File Format select PDF clicking Save to convert it back to PDF. Editing PDF from Word might be popular but as you might have already figured out there’re better tools of doing this without actually moving from PDF to Word, which offer extra highly advanced features to modify your PDF texts and images and make your PDFs more professional.